Raegan with her Nikon D90 in North Straub Park during our 1-on-1 DSLR photography lesson - St. Petersburg FloridaThe first true afternoon 1-on-1 DSLR Photography Lesson of the fall was with Raegan and her Nikon D90, meeting at 3pm which would be unthinkable most months of the year in Florida. 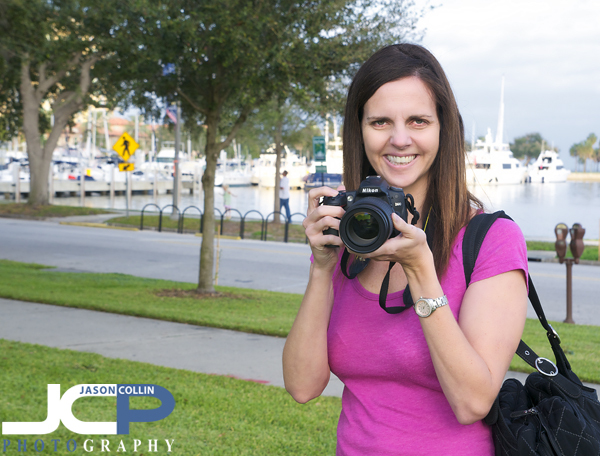 She has had her D90 for quite sometime and had even taken other photography lessons in the past, but was still looking for a better way to tie together aperture, shutter speed and ISO. Of course, that is exactly what my lessons aim to do from the get-go. Since Raegan did have some photography knowledge to start with, and was already shooting in manual mode, I described to her my 5-step process for making a well exposed and sharp image in any chooting conditions in a bit more detail at first than usual. In particular shutter speed limits, with those of course being in general 1/60th for still subjects and 1/500th for moving subjects. Knowing those two limits is the key to eliminating blur and camera shake. We ended the lesson with a little flash portrait practice in North Straub Park along with a few composition tips that make a big difference in the final overall look of a portrait. I hope now that Raegan can confidently photograph her children in focus when they are sitting or moving, or both!